Heat oil in 12-inch nonstick skillet over medium-high heat. Cook green beans and bell pepper in oil about 5 minutes, stirring frequently, until crisp-tender. Stir in tomatoes and salt. Cook 3 minutes. While vegetables are cooking, cook and drain ravioli as directed on package. Mix sour cream, pesto and lemon peel in small bowl. Toss hot cooked ravioli with vegetable mixture and sour cream mixture. For a lovely early summer supper, serve this meatless dish with wedges of melon, clusters of grapes and garlic breadsticks. You can use 4 ounces of asparagus, cut into 1-inch pieces, and 4 ounces of snap pea pods instead of the green beans. 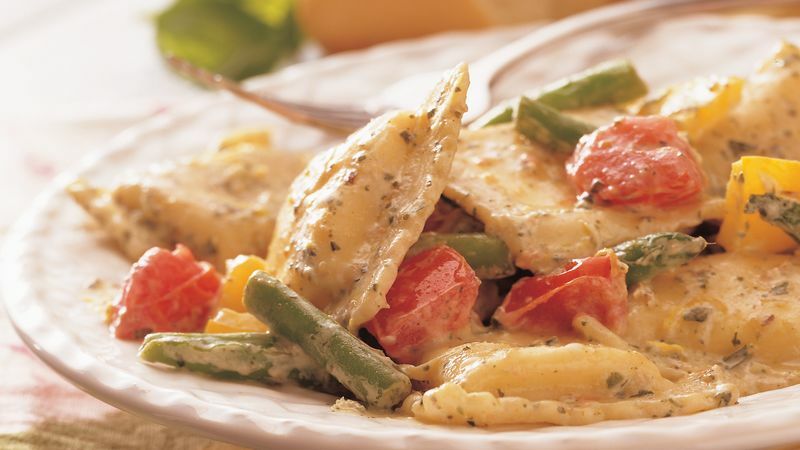 This dish is delicious just as it is, but if you like, sprinkle the top with shredded Parmesan cheese.